Spearheaded by Marianne Byrne and Rich Nolte of Wildstyle Bengals, the CFA Board accepted the Bengal in Miscellaneous status at its Feb 7, 2016 meeting. You can view the Online Bengal Breed Presentation presented to the Board by the Bengal supporters. Bengals may now be exhibited in the Miscellaneous class beginning May 1, 2016. This is the first step towards the Bengal achieving full Championship status in CFA. Submit a 5 generation Certified Pedigree from another registry containing no domestic or non-domestic outcrosses. This means the Bengal must be F6 or later to be registered in CFA; it must be six generations removed from any ALC or non-Bengal domestic cat ancestors. Submit a CFA registration form available at http://www.cfa.org/portals/0/documents/forms/registration-via-pedigree (The current form cannot be used until it is updated). Rosetted Bengals are called ROSETTED on the registration form. The Spotted Bengals are called SPOTTED. Make a payment of $40 in USD. Once BOTH the sire and dam of a litter are registered in CFA, their litters will be registered through the standard CFA registration process which include both online and paper registration forms. The MISCELLANEOUS (Non-Competitive) CLASS is for any registered cat or registered kitten of a breed not accepted for Provisional Breed competition. Class entries are examined by judges; however, no awards are made. Bengal cats must be CFA registered to be allowed in a CFA show hall. 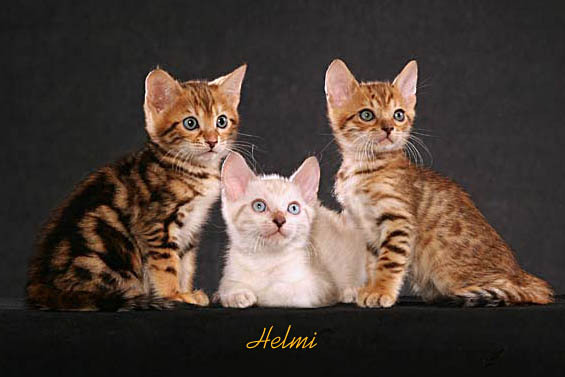 Bengal kittens must be CFA litter registered to be allowed in a CFA show hall. CFA President, Mark Hannon, appointed Marie Vodicka of Fractal Bengals to be CFA's first Bengal Breed Committee Chairperson. To qualify for Breed Committee membership after the first year, breeders need to exhibit at least one cat and register at least three litters. Have a CFA registered cattery name. Are at least 18 years of age or older. Have registered at least one cat of the appropriate breed. A judge or an officer of another cat registering association is not eligible. The New Vision Cat Club was accepted as CFA's first Bengal Breed Club.